The 1968 baseball season was scheduled to start on April 8. Not every team was slated to play on Opening Day half a century ago; but 1968 was one of the most dramatic years in the history of America and of baseball. It was a year of assassinations, political protests, and social upheaval. Although the baseball season is now well underway, one need not look hard to find similarities to today with a nation divided on ideological lines. 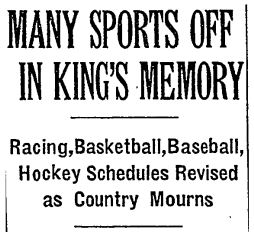 And sports would intersect with politics throughout that tumultuous year. In baseball, 1968 was the year of the pitcher. Bob Gibson finished the 1968 season with a remarkable 1.12 ERA. Denny McClain of the Tigers became the last pitcher to win thirty games in a season. The overall American League batting average was .230 and batting champion Carl Yastrzemski was the only AL player to hit over .300 for the season. Gibson’s Cardinals would face McClain’s Tigers in a taut seven game World Series, won by the Tigers. 1968 would be the last post-season with one playoff round, as baseball created Eastern and Western Divisions and added a League Championship Series for the 1969 season. New York Times, April 7, 1968. The start of the 1968 season was delayed by two days, as teams, like the rest of the country, mourned the assassination of Dr. Martin Luther King, Jr. Dr. King was shot and killed on the evening of Thursday, April 4, 1968. The country plunged into distress, anger, and fear. Urban areas across the country saw protests and violence. Opening Day was scheduled for Monday April 8. But with Dr. King’s funeral scheduled for Tuesday April 9, major league players, with African-American players like Roberto Clemente in the forefront, announced that they would not play until after Dr. King had been buried. In an ironic twist, it was the Los Angeles Dodgers who were the last team to agree to postpone their season opener. The Dodgers were scheduled to host the Philadelphia Phillies on the evening of Tuesday April 9. The Dodgers announced that, as this would be after the conclusion of the funeral services for Dr. King, they intended to play the game as scheduled. The Phillies – players and management – announced that they would not play, accepting a forfeit if necessary. In 1947, it had been the Dodgers and Jackie Robinson who stood in the vanguard of racial progress. In 1968, the roles were reversed. And it was in Philadelphia where Robinson and the Dodgers endured some of the most hateful language and on-field violence of his historic rookie season. Twenty-one years later, it was the Phillies who stood steadfast with the Civil Rights movement. Ultimately, the Dodgers relented, rescheduling the game until the following Tuesday night, and starting their season on Wednesday April 10 together with the rest of the league. Season openers in Chicago, Baltimore, and Detroit were contested even though those cities were under an official State of Emergency designation. In Washington, D.C., the city that suffered some of the worst discord and protest in the wake of Dr. King’s assassination, D.C. Stadium, home of the Washington Senators, was being used as a staging area for soldiers mobilized in response to the protests in the capital city. On the morning of April 10, National Guard and 82nd Airborne troops pulled out of the stadium, so the Senators and Minnesota Twins could take the field. In Baltimore, the game was moved from the evening to an afternoon start, in case of continued turmoil in that city. The Orioles found themselves short-handed as lefty reliever Pete Richert had been called into service with his National Guard unit in Washington, D.C. and their gold-glove shortstop, Mark Bellanger, was called up to the Maryland Air National Guard. Overall, observers and media commentators praised the players, owners, and commissioners for the decision to postpone the start of the season. The memory of the NFL playing on the Sunday immediately following the assassination of John F. Kennedy, a move widely derided, served as an example of what not to do. Other sports would be enmeshed with politics and the nation’s tumult. Perhaps the most famous protests by African-American athletes came in the 1968 Summer Olympics in Mexico City, where John Carlos and Tommie Smith raised their clenched fists in the Black Power salute, on the medal podium. In a divided country, sport can offer a distraction, a release, and a sense of belonging. We must appreciate that sport is both impacted by and reflective of our politics and civil society.